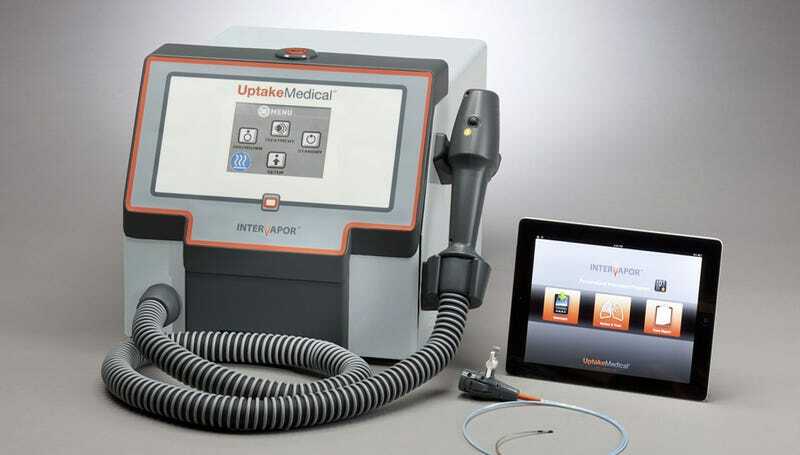 Uptake Medical's InterVapor looks like a steamer used to iron clothing. But it's actually designed to deliver a blast of piping hot steam to your lungs, which they claim will actually help alleviate the symptoms of emphysema and other lung conditions. At first glance it certainly looks like the poster child for cures that are worse than the diseases, but it's not like you just stick your mouth on the end of that tube and inhale. The treatment has to be administered by a doctor who inserts a bronchoscope down your throat and deep into your lungs. The InterVapor's catheter is then extended, where a small balloon inflates to seal the airway. A blast of scalding hot steam is delivered for 3 to 10 seconds, which is used to intentionally damage the lung tissue. As it heals, though, the scar tissue takes up more space inside the lung, reducing its capacity but also making it easier for the patient to breathe afterwards.